Elaine and Harry Mensh argue that by using tests to decide whether or not a child should receive a quality education, schools can continue to apportion superior and inferior educational resources according to class, race, and gender. 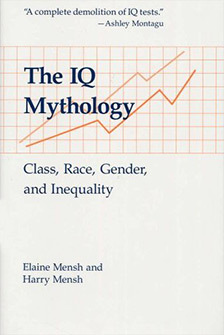 In this comprehensive study, Elaine and Harry Mensh clearly demonstrate that IQ tests have been fundamentally biased from the very beginning. These tests, they argue, serve to maintain the status quo of unequal educational opportunities. Unique in the literature of IQ testing, their analysis demonstrates that mental measurement is a pseudoscience. They show an intrinsic bias in the testers’ concepts and methods that precludes either positive development or improvement in the tests. They also provide the first fundamental critique of the hereditary-environmentalist debate.